Funhouse mirrors come in a variety of distortions. Below is an explanation of what the different types of funhouse mirrors do. Please keep in mind that a funhouse mirror shows a different shape every time, so what you see also depends on your own imagination and the way you stand in front of the mirror, close or far away. The type of distortion a person sees is based largely on his or her line of sight as well. For a better understanding of how funhouse mirrors work, please visit our “How Funhouse Mirrors Work Blog”. VERTICALLY CONCAVE: Makes you look longer. VERTICALLY CONVEX: Makes you look shorter. HORIZONTALLY CONCAVE: Stretches your reflection horizontally when you stand close. HORIZONTALLY CONVEX: Makes you long and slim. The FEEL-GOOD mirror. CONVEX CONCAVE CONVEX: Shows you with double legs and a short torso. 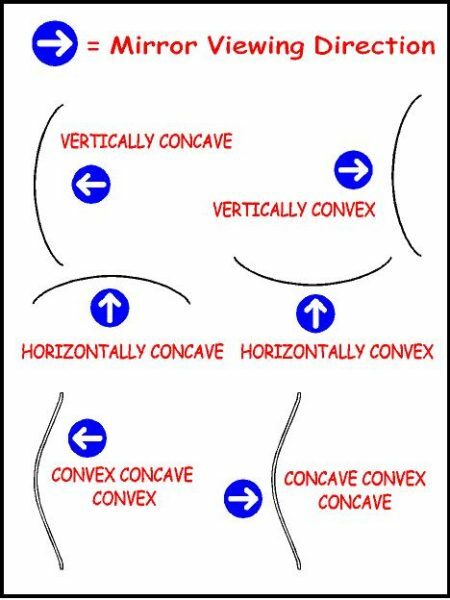 CONCAVE CONVEX CONCAVE: Makes you look small and fat. Please Note: Not every style mirror we manufacture is available in all of the above distortions.